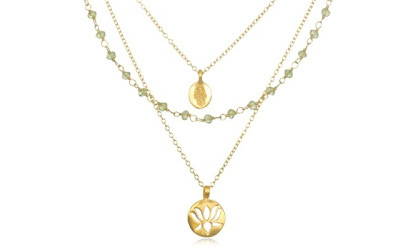 The Satya Jewelry "Thrive Peridot" Yellow Gold Plate 16" Necklace is currently selling for just $33.60 on Amazon.com! You will be saving 76% off the listed price of $138.00 with this jewelry deal. What I like about this layered necklace is the soft color of the Peridot. That coupled with the Lotus flower pendant, this necklace elicits positive Zen-like feelings from me.